When you run the report from Invoice Management a Summary of Unbilled Work form is opened. From this screen you have greater filtering and invoicing options than you get when running the static version from Performance reports. 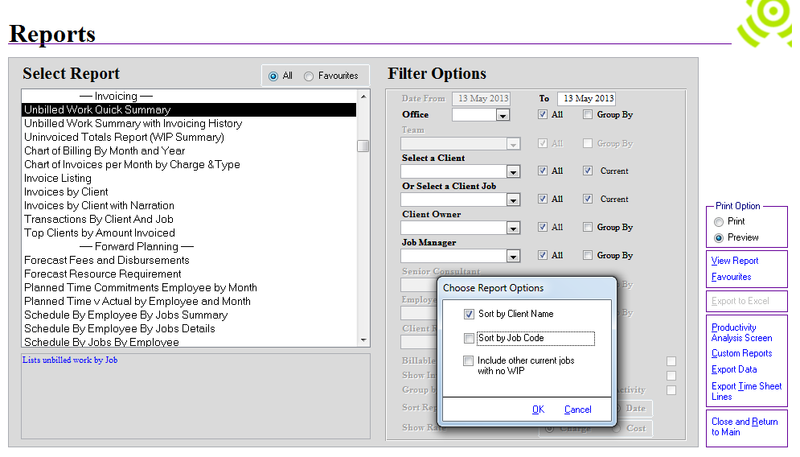 Filter by: Date, Office and Unbilled Amounts (Choose to “Show All” totals, or only those Less/Greater than an amount specified). Sort by: Client Name or Job Code. Select all, or only specific jobs in the list. View more detailed reports of these selected jobs only. Invoice Preparation Information Report View 2Assign outstanding time to the last invoice. Create a write off invoice for all outstanding time. This reports on some of the same details as displayed in the form, and includes a breakdown of WIP totals into Fees, Disbursements, Cost and Charge. This entry was posted in Invoicing, Performance Reports and tagged invoices, Prebilling reports, WIP, write offs by Jen. Bookmark the permalink.